Cold brew has been around for decades, but it’s just the past few years that cold brew has seen explosive growth. Cold brew sales are expected to have a CAGR (Compound Annual Growth Rate) of 24.7% annually from 2018 to 20251. That means the explosive growth of cold brew up to this point is only going to continue. Has your company kept pace with that growth? If not, you’re missing out on serious revenue opportunities from a customer base that is looking for a specific product! I’m writing this article because I was contacted by a coffee shop owner yesterday who just opened a coffee shop. She called me on her 3rd day of being open for business looking for a way to produce more cold brew. They had sold out of cold brew in each of their first 3 days. 15 gallons of cold brew each day! This was a good problem because it showed that the demand was there, but this was obviously a bad problem because it resulted in a large amount of missed sales. We all make mistakes, but it’s those mistakes that teach us and help us grow. Here are some of the common mistakes that clients and customers have shared with us over the years. This seems like a no-brainer, but you’d be surprised at the number of companies who fail to put cold brew on the menu – even when they’ve been making cold brew and have it available! The reason I’m writing this article was a phone call that I received yesterday about this specific topic, but this was not an isolated incident. I’ve heard this time after time that shops only make 5 gallons of cold brew and when it’s gone, it’s gone. Seems silly to me, but I guess it’s that Texas BBQ mentality…. “When we sell out, we’re closed”. You’d be amazed at the number of shops who only make 5 gallons of cold brew at a time. With large batch cold brew systems, there is no reason to only make 5 gallons at a time when you have the option to produce batches up up to 50 gallons from a single vessel. In addition to pouring drinks from the tap, taps also give you the opportunity for branding with customized tap handles. Most importantly, draft cold brew gives you the opportunity to offer growler fills — this is the quickest and easiest way to increase cold brew sales in cafés. Scaling up to keep up with demand is a good thing, but if you’re scaling by brewing multiple small (5 gallon or less) batches of coffee, then you have a lot more room for variance in your cold brew. Why use ten 5 gallon cold brewers when you could simply brew a single batch in a 30 or 50 gallon cold brew system? Just imagine the time saved in cleaning 1 cold brew vessel verse cleaning 10 smaller systems! One reason that putting cold brew on draft is so important is because it gives the option and ability to sell larger amounts in a single transaction. Rather than selling a glass of cold brew that would likely range from 8-16oz, you now have the option to not only fill growlers, but sell growlers with your logo and marketing on them! Growlers can be sold in many different sizes – 32oz, 64oz up to 128oz – why not sell a gallon at a time? Like the idea of selling larger amounts of cold brew? Sell kegs too! 5 gallon kegs of cold brew can sell for anywhere between $100-$200 per keg. That’s the equivalent of selling 20-40 cups of cold brew, but doing it in a single transaction. These are some common mistakes that we see when it comes to serving (or not serving) cold brew in cafés / coffee shops / roasteries. Have you made any of these mistakes? Have you taken the necessary steps to correct them? If you have a coffee shop or are opening one up, plan on taking advantage of the fastest growing beverage category in the market – cold brew. If you have the mentality, “We’ll start small and see how it goes”, that same sentiment will likely show through your marketing and the push behind your cold brew offerings. how can you expect your customers to be excited about your cold brew? 5 years ago, cold brew was maybe considered hip, trendy or a fad, so of course there was reluctance to “go big”, but with its continued growth through 2019 it’s now a fact that cold brew is here to stay. Let’s face it, 5 gallons of cold brew isn’t very much anymore. I personally brew that amount for myself to have in my kegerator at home. As a cafe, 5 gallons is limiting – start with the potential to brew more than you’ll need in case demand rises. Cold Brew Avenue makes Stainless Steel Cold Brew Systems that range from 5 to 50 gallons in capacity… That means more and more coffee shops and cafes are choosing to have the ability to brew 3 to 10 times as much as those who brew in 5 gallon systems! Don’t get me wrong, I’m not bashing 5 gallon cold brew systems. There is definitely a place for them, whether that be test batches, high dollar coffee lots, home use or just trying to produce enough to fill a single keg. If you’re cold brewing and expect to go through 10+ gallons per day, why not start with the end in mind? Start with a larger system… nothing says that you have to brew full batches every time you brew. Use your 30 gallon system to brew 20 gallons and scale up when your demand requires it. People not only love the taste of cold brew, but they love the convenience of it. Cold brew has a stable taste and flavor so bottling it and selling it is an option that traditionally brewed coffee never had. Selling cans and bottles of cold brew gives customers a great way to purchase cold brew and have enough for the week. If you’re a coffee roaster who also provides cold brew, a “Take & Brew” or a “Brew Your Own Cold Brew” at home is a great way to move more beans. Create a small package, or an instruction sheet that goes along with a bag of coffee beans or fresh ground coffee that instructs the customer how to brew cold brew at home. This is a great option for the customer who is interested in the process and wants to recreate it at home. Cold brew coffee is here to stay, but are you taking full advantage of it? In warm weather locations like California, Florida, Hawaii for instance cold brew is a year round beverage. 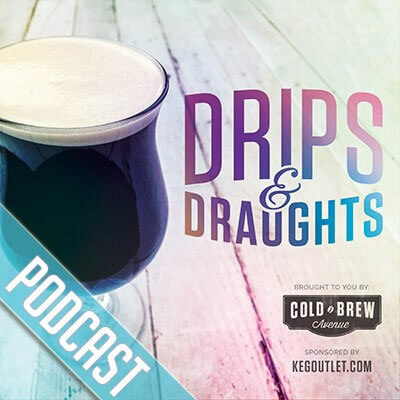 In some cooler climates and locations that experience ‘seasons’, cold brew sales may slow down in the cooler months, but that doesn’t mean that it should be dismissed. A New York chain suggested that cold brew sales in summer almost completely reverse from what they see in the winter months – approximately 75 percent hot coffee and 25 percent cold brew during winter time flips to about 65 percent cold brew and 35 percent hot coffee in the summer months3. Regardless of where you’re at, cold brew is in demand. Will you meet that demand? Let us know what you do to move cold brew in your shop or café in the comments below!